Buying buggies is for me a bit like buying handbags. I want one for every occasion and eventuality, no matter how little I might use it. 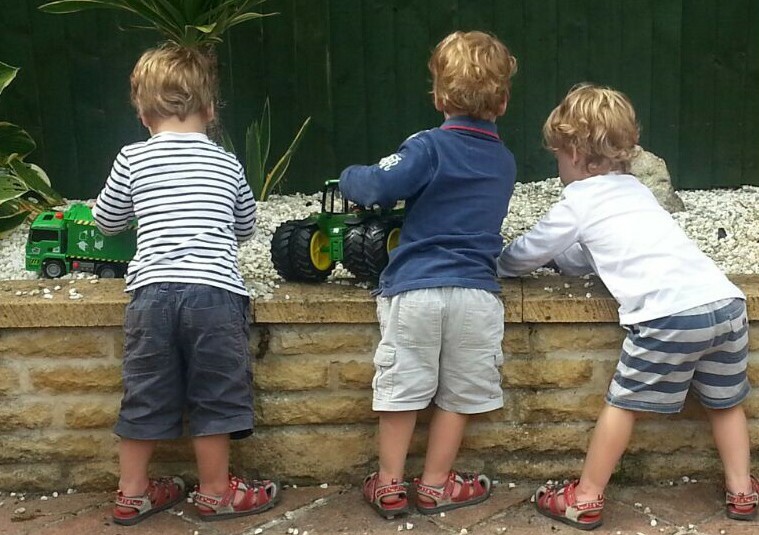 I have managed to stop at four buggies (so far), but I know other triplet mums who have gone on to have 6+ just to keep up with the ever changing needs of three toddlers and to try and make life a little easier. Many of you know that I have the ABC Triple Adventure Buggy which is quite marvellous in my opinion you can’t beat it as a triple buggy for newborns. It is however getting rather heavy, I am currently pushing around 8 stone of baby and buggy! I realise that pushing three babies around is never going to be a light job, but I thought I would share with you what I and others use to get around with older triplets. 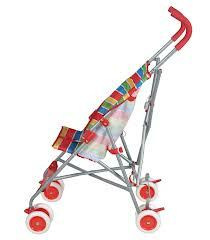 So far these have faired me very well and I haven’t had the need to buy any other prams. I will often use the double lightweight pram to get from the car to playgroup if I’m on my own as I can steer it with one hand and hold on to the hand of the walker. It is a bit tricky, but it does the job. If John and I are taking the boys out together we will usually use the ABC (converted into a double) and the Britax single buggy. I am now however contemplating whether to buy a buggy board or a little bike to go on the back of the ABC (after I have taken off the top seat and it becomes a double). I am finding it increasingly difficult to load the top baby into the pram and they often hate not being able to see where they are going. The problem with buying a triple side by side is the obvious width issue that you will encounter. I live in a small market town and I can’t fit my double down some of the pavements so this just isn’t an option for me. So, what is available to us at the moment? Description on the Twins UK website: The Choo Choo Wagon is a very unique ride-on with connecting cars like a choo choo train for twins to ride in. If you are looking for a fun twist on the usual style of wagons, then you should check this one out. 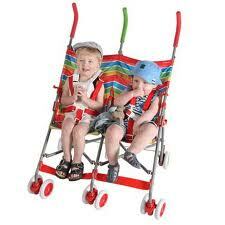 Twins love wagons and they will especially love pretending to ride around in their own choo choo train! Each car features a comfortable seat and roomy foot well along with a built-in holder in each car for cup, bottle or juice box. The wagon has 8 silent ride tyres for a smooth quiet ride and the cars lock together securely for child safety. Made of durable plastic for increased strength and long-lasting use. The twin wagon can be attached to another Choo Choo trailer for even more fun and is the perfect addition for extra storage space or larger families with triplets, quads or other young siblings – add up to three Choo Choo Trailers (sold seperately). I know quite a few triplet mums who have bought this and although the general feedback is quite positive some people have said that it is not good on bumpy ground, the connectors between the carts can be a bit dodgy and is tough to pull up hill. 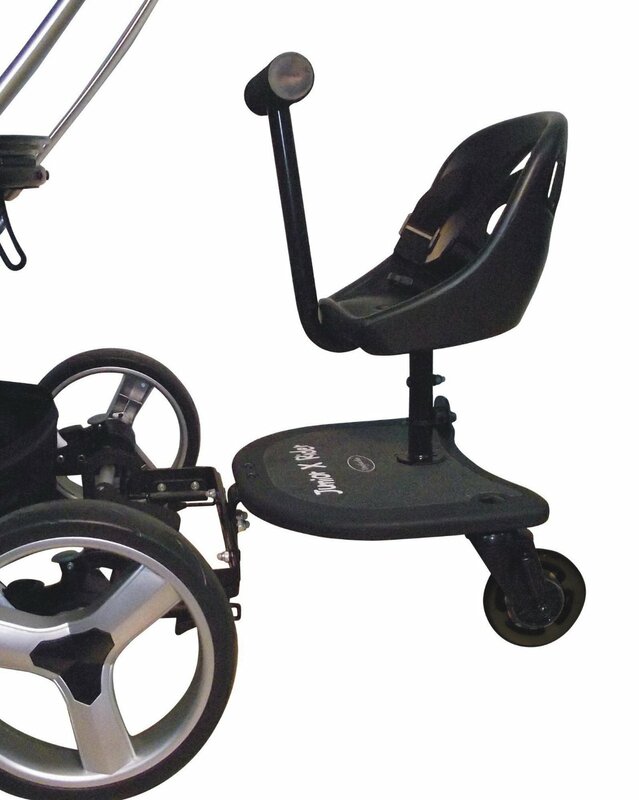 Description on the Kiddicare website: The Buggypod attaches to most pushchairs, transforming them into a two-seater when needed, and folding up neatly when not.The Buggypod moves with you and your toddler to make outings fun, safe and easy. Toddlers love helping to push their Buggypod. Encourage them to walk and help them to develop their road sense while keeping them close at hand. When they get tired they can sit down and be harnessed in for a comfortable ride. Buggypod Smorph2 extends our design philosophy into a new clip-on side car for pushchairs. Strong and robust, the Buggypod Smorph 2 can now carry up to 15Kg so your toddler can enjoy their special space for longer. Buggypod Smorph 2 combines design, outstanding functionality and innovative flexibility to provide a safe space for your toddler to sit down for a comfortable ride when they need it. I know a lot of mums who use this with a tandem pushchair (one behind the other with this on the side) so all of the babies are facing the same way, but it is only as wide as a double buggy. This is probably one of my favourite options so far and I am seriously considering buying one to aid my poor back! Nobody in our triplet group has tried one yet so I am not able to give you any feedback unless I take the plunge and buy one! They have a Youtube video for the buggy too. 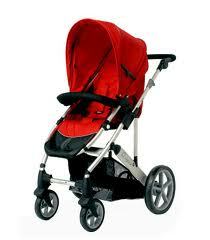 3) Buy a double buggy and have the other baby in a sling or a separate pushchair. I decided against this idea as I have a bit of a weak back and when the babies got bigger I figured this probably wouldn’t do me much good! If however you did decide to go for this option then check out the slings and twin push chairs at Kiddicare, they have by far the best selection in store where the friendly staff can advise you further. Having read countless reviews I finally settled on my ABC Adventure buggy! It is in my opinion the best option for transporting triplets! It has so far been down cobbled streets, along narrow country pavements, through thick mud down country lanes and even through sand (although I wouldn’t recommend the latter!). I even managed to manoeuvre it through a busy shopping centre and most of it’s shops. The only thing I would say is that if you have the triple or the quad version it can be quite difficult to see over and I wouldn’t recommend it for anyone who is less than about 5ft 6inches (I am 5ft 8inches to put things in to perspective). It will fit through a standard width door and it will lie flat in a Ford Galaxy, Seat Alhambra and VW Sharan. I know it will also fit into a Ford C-max Grand, Ford S-max and VW Touran, but it is a squeeze as you will see from my photos on previous posts. One final point to the distributers in the UK – hurry up and get with the times! 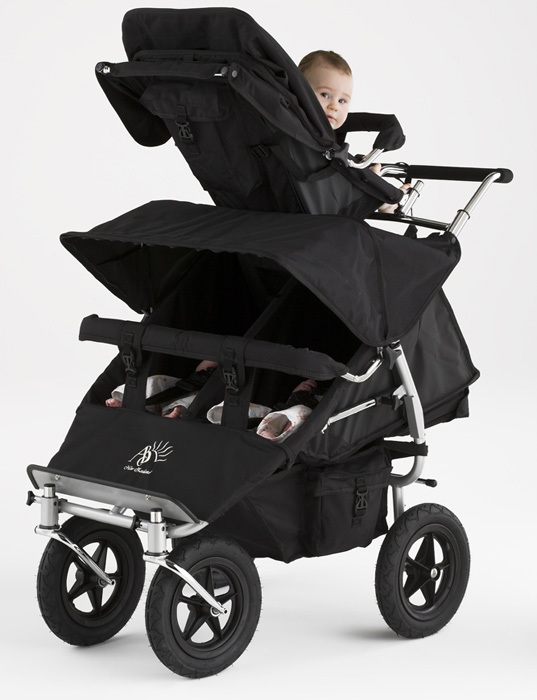 Triplets need buggies too and we shouldn’t have to order them from New Zealand! You are missing out on valuable customers!